No more manual copying and pasting. Export orders to QuickbBooks easily. Keep your orders up to date in your Ecwid store and QuickBooks dashboard. QuickbBooks is an easy-to-use online accounting software tool that’s designed specifically for small businesses. Make your business look good. 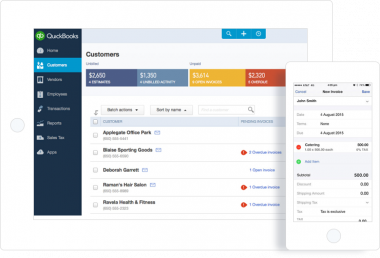 Create custom, professional invoices, sales receipts, and estimates that reflect your business and your brand. Stay on top of who owes you, how much, and when their payment is due. With a few clicks, you can email overdue customers from your phone. Instantly see how your business is performing. With a single click, you can see your profit & loss, balance sheet, and dozens of other reports. Take care of business anywhere. From the coffee shop to the airport lounge, follow up on a late invoice, take care of your run payroll, or update customer data from your mobile or tablet.